LAHORE (92 News) – Maryam Nawaz, daughter of former premier Nawaz Sharif, after meeting her incarcerated father at the Kot Lakhpat jail on Thursday said he remains unwell with continuous angina. Maryam Nawaz along with grandmother Shamim Begum and other family members visited Kot Lakhpat jail and met with Nawaz Sharif as the workers showered rose petals on the car of the family and chanted slogans in their favour. Talking to the journalists while returning from jail, the mother of Nawaz Sharif said that she hoped his son will soon get a release as her all prayers with him. Meanwhile, captain (rtd) Sfdar and Nawaz Sharif’s personal doctor Adnan also met him. The PML-N workers also exchanged harsh words with the police personnel outside the jail during the meeting day. 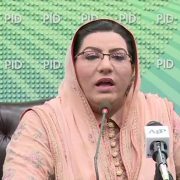 Responding to Maryam’s tweet, Punjab CM’s pokesperson Dr Shahbaz Gill quoted the doctors as saying that the former premier is healthy. Nawaz’s blood pressure is normal and he had a healthy breakfast, Gill tweeted.